Traditionally, these Ogham are read as if the top is the line which the letters sit on, but this one has a double message, and uses the ground as the line also. The compound message is very interesting. On the SW side there is one line, on the NW side three lines, on the NE side two lines, and on the SE side five lines. (1) Using those marks from the first two sections of the Ogham tract, gives you two words per side. I am giving the most basic meanings. One line is for Beith, the Birch and stands for a new start, beginning, it also leads the way. One line is for Huathe, the Hawthorn or Whitethorn. This is connected to a period of waiting and restraint. If there was someone around to record the fact that the Birch tree was the first to grow after the last Ice Age, they would have had quite a wait before moving further inland to do anything. The last Ice Age didn’t cover all of England. The ice covered Ireland, the St. George’s Channel right down to the Scilly Islands, followed the west coast of southern England, cut across England north of the Bristol Channel, then more or less cut across the width of the country, passing slightly north of the Thames Estuary. That was as far south in England as the ice came during the last Ice Age, but it would be extremely cold, and when the ice melted it was very wet. Even Glastonbury Tor was surrounded by water and marsh. You wouldn’t be laying out Stonehenge at that point. However, St. Michael’s Mount is the axis point for the St. Michael’s Ley and the St. Michael-Apollo line. If you were going to Ireland or the Continent from there, you may have had a period of waiting. Waiting for a seaworthy vessel to take you there. Three lines are for Fearn, the Alder, which is for oracles and protection. It is connected to Bran and his talking oracular head. Three lines are for Tinne, the Holly, which means best in the fight and protection. The fight being both spiritual and physical. Spear shafts were often made from Holly. 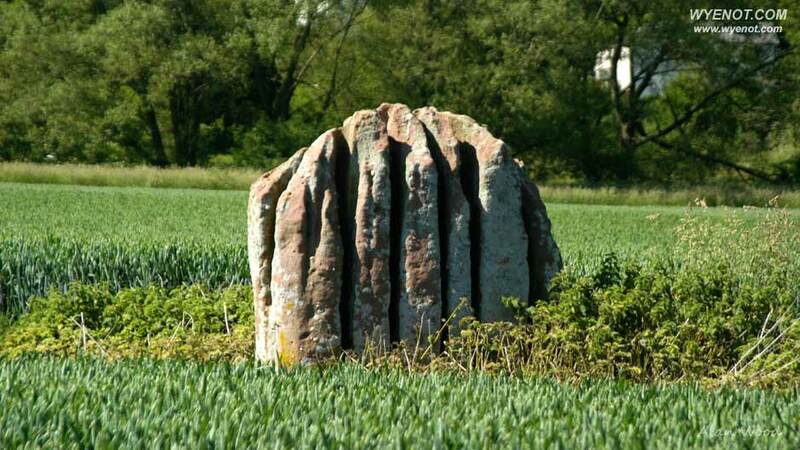 Somewhere to the NW of the Queen Stone, there must have been an oracle centre. Perhaps the lady buried with the Mold Gold Cape was the oracle. The Cerne Abbas Giant has this same message on his ribs. Since his club points toward the Trendle, perhaps that was an oracle centre also. His club has three round knobs, the three planes of existence, past, present, and future. An oracle can be any type of divination. Card reading, tealeaf reading, astrology, crystal ball gazing, palm reading, Ogham stick or Rune stick reading, etc., and they all deal with your past, present and future. The oracle, King Gudea went to see, seemed more like an advisor, she interpreted his dreams and explained what they meant. Some accounts make them seem more like the local psychologist/advisor. Two lines are for Luis, the Rowan which symbolizes protection against enchantment, it was also used for metal divining and to cut Runes on. Two lines are for Duir, the Oak, which represents the doorway to enlightenment/the mysteries, but also gives solid foundation and protection. If you learned the mysteries, you’d be enlightened. Since we see it here with something which was used for metal divining, perhaps there was a ‘school’ for metal smelting and smith craft to the NE. Five lines are for Nuin, the Ash. This is the Cosmic Ash, that which links the microcosm and macrocosm. The Earth is the microcosm and everything else around it is the macrocosm. Five lines are for Quert, the Apple, and is associated to the Celtic Apple lands, which is where Stonehenge and Glastonbury Tor are situated. It is sometimes thought that only the great hill at Glastonbury Tor was Avalon, but Glastonbury Tor is the Glass Castle which sits in the centre of the equal armed Celtic cross. Stonehenge is the city of the East position, the position of Air. It is said that Avalon was an orchard, and that Merlin could move it from place to place. The ‘orchard’ is the Grove or sacred place which contains all the trees, shrubs and plants of the Ogham tract, and as I’ve shown in previous writings, if you knew how to use a calendar circle, the sacred place, you could move it anywhere in the world. Since the Grove symbolizes all the knowledge contained in the tract, you would have a wide range of knowledge, enough to set up a well organized society anywhere you went. The Apple also represents a thing of beauty, and when you cut an apple width ways, you will see a pentagram made by the seed pockets. Stonehenge was the Ash tree in Avalon, and a thing of beauty in its brand new state. Up until then, no one had ever seen anything like it, in fact, it has remained rather unique to this day. This entry was posted in Ancient History and tagged Ogham, Queen Stone.